This installment of my "Ghost City" column for The Grid was originally published on November 13, 2012. Toronto Star, June 24, 1936. Over 75 years after the first cash register rolled off the line at the National Cash Register (NCR) plant at Dundas Street West and Landsdowne Avenue, the bells are still ringing. The shell of classic industrial architecture seems appropriate for the warehouse-style grocers who have taken advantage of the building’s ample room for refrigeration, storage, and merchandising since the mid-1970s. The Globe, June 25, 1936. Click on image for larger version. Before NCR purchased the property during the mid-1930s, site occupants included the original home of St. Helen’s Roman Catholic Church (which moved a block east) and, during World War I, army barracks. 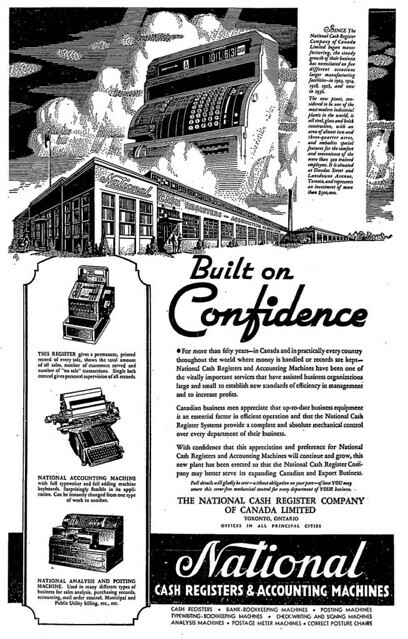 On November 27, 1935, Canadian Manufacturers’ Association president W.S. Morden turned the sod for the $300,000 plant. Opened in June 1936, the 75,000 square-foot facility included a machine shop, assembly area, and stock department. It was intended to supply cash registers and other business machines to Canada and the rest of the British Empire. The yellow-bricked Art Moderne façade was designed by architect Thomas E. Muirhead, whose other works included the Kenson Apartments on Grosvenor Street. The Star noted that the plant offered employees “comfortable working conditions and lighting of the most modern kind.” NCR also provided a generous Christmas bonus—employees who had worked more than three months for the company by the end of 1936 received $25, with an extra buck per year of service. The company’s growth prompted two additions built between 1947 and 1950. The site switched from building cash registers to utilizing them when Knob Hill Farms bought the building in the mid-1970s to serve as its first warehouse-style “food terminal” location within the City of Toronto. Customers could watch trucks unload fresh goods in the middle of the produce department and butchers practise the fine craft of meat-cutting. “I don’t like to do things behind closed doors,” noted chain proprietor Steve Stavro. “I want the customers to see everything and feel part of it. If you’re selling proper merchandise, you should have nothing to hide.” Among the perks the store offered were late shopping hours and a courtyard statue of Neptune Stavro imported from Italy. It wasn’t the prettiest store, but it offered affordable prices and a deeper selection of multicultural foods than other chains. Toronto Star, August 28, 1975. Click on image for larger version. Knob Hill Farms was packed from the moment it opened in September 1975. The 200-space parking lot barely coped with the 50,000 customers who filed through during the store’s first week. The store easily absorbed the $25 fines it received for violating the Lord’s Day Act by staying open on Sundays. Stavro felt it was the only day of the week many of his customers could grocery shop, a position still vindicated by the long lines seen at any supermarket on an average Sunday. The combination of weak financial penalties and traffic jams led Toronto city councillor Tony O’Donohue to call for tougher bylaws on Sunday openings if Queen’s Park didn’t enact promised legislation surrounding the issue. The province soon passed new Sunday opening laws that resulted in Knob Hill Farms, along with other non-convenience-store food purveyors, locking its doors during the official day of rest. Not until 1992 did the store open on Sunday without worrying about fines. After a quarter-century run, the store closed along with the rest of the Knob Hill Farms chain in 2000. Near the end, customers complained about wide pools of water streaming from aging refrigerators. The store sat vacant for several years, during which it was designated as a heritage property, before reopening as a No Frills, which provided a modernized take on Knob Hill’s low-cost warehouse concept. Additional material from the September 18, 1975 edition of the Globe and Mail, and the November 27, 1935, June 24, 1936, December 16, 1936, August 28, 1975, and October 1, 1975 editions of the Toronto Star.